Facts and information about the History of Clothing and regalia of Native American Indians and their War Shirts. Native American War Shirts were ceremonial tunics that were worn at important ceremonies and rituals. Unlike their name would seem to indicate they were rarely worn during battles. These special items of clothing were adorned with many different types of decorations including intricate beadwork, symbolic paintings, sacred ornaments, feathers and fringes. 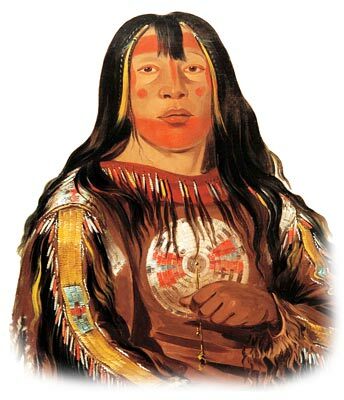 Human hair was also attached in the form of a scalp taken from an enemy (scalp lock) or a good luck charm from a member of the warrior's family. The privilege of wearing war shirts could only be granted by tribal councils in recognition of brave deeds in battle. The history of traditional or ceremonial dress and regalia worn by Native American Indians is a fascinating subject. The following fact sheet contains interesting facts and information on War Shirts worn by the Plains Indians.